การลงประชามติในวันที่ 23 มิถุนายน ค.ศ. 2016 มีหัวข้อว่า "สหราชอาณาจักรควรจะยังคงเป็นสมาชิกของสหภาพยุโรปหรือถอนตัวจากสหภาพยุโรป ?" ซึ่งได้รับเสียงข้างมากว่า "ถอนตัว"
นายกรัฐมนตรี เดวิด แคเมอรอน ประกาศลาออกหลังผลประชามติให้ "ถอนตัว"
↑ DAvis Butler. "The 1975 Referendum" (PDF). Eureferendum.com. สืบค้นเมื่อ 19 May 2016. ↑ แปลจากต้นฉบับ: "Do you think the UK should stay in the European Community (Common Market)?" ↑ "Research Briefings - The 1974-75 UK Renegotiation of EEC Membership and Referendum". Researchbriefings.parliament.uk. สืบค้นเมื่อ 19 May 2016. ↑ Nicholas Watt (29 June 2012). "Cameron defies Tory right over EU referendum: Prime minister, buoyed by successful negotiations on eurozone banking reform, rejects 'in or out' referendum on EU". The Guardian. London, UK. สืบค้นเมื่อ 2 July 2012. David Cameron placed himself on a collision course with the Tory right when he mounted a passionate defence of Britain's membership of the EU and rejected out of hand an 'in or out' referendum. ↑ Sparrow, Andrew (1 July 2012). "PM accused of weak stance on Europe referendum". The Guardian. London, UK. สืบค้นเมื่อ 2 July 2012. Cameron said he would continue to work for 'a different, more flexible and less onerous position for Britain within the EU'. 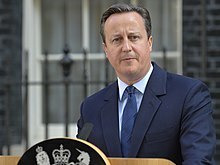 ↑ "David Cameron promises in/out referendum on EU". BBC News. BBC. 23 January 2013. สืบค้นเมื่อ 23 April 2016. ↑ "David Cameron sets out EU reform goals". BBC News. 11 November 2015. สืบค้นเมื่อ 16 January 2016. ↑ Hughes, Laura; Swinford, Stephen; Dominiczak, Peter (5 January 2016). "EU Referendum: David Cameron forced to let ministers campaign for Brexit after fears of a Cabinet resignation". The Daily Telegraph. สืบค้นเมื่อ 9 January 2016. ↑ "EU referendum outcome: PM statement, 24 June 2016". gov.uk. สืบค้นเมื่อ 25 June 2016. ↑ "สภาอังกฤษผ่านร่าง "เบร็กซิต" "โอกาสกลับหลังหันหมดลงแล้ว"". ประชาชาติธุรกิจออนไลน์. 4 ก.พ. 2017. หน้านี้แก้ไขล่าสุดเมื่อวันที่ 15 มีนาคม 2562 เวลา 10:29 น.